Acoustic Screening is used primarily to reduce the level of direct radiating noise from plant or machinery – Often in an outdoor space such as a power generation plant or any large industrial situation where noise generation could be an issue for either the staff working onsite, residents nearby or wildlife who could be adversely affected by loud ambient noises. Acoustics screening can be quite simple in construction but serve their purpose well, they are made up from an absorbent surface of the screen facing the incoming sound, which also acts to reduce the reverberant noise levels experienced by personnel working within the locality of the screen. The ever-increasing size of both transformers and electrical switchgear means noise issues are also increasing. Combine this with increasing population density and you can see where they two ideals may clash and noise control or reduction is required to help bring the noise created to levels that are both within legal requirement and affordable for your business. Whilst Acoustic Enclosures are an ideal way of containing noise in a confined area, there are often occasions where a more cost-effective solution is required that will still deliver exceptional noise reduction results. Erecting acoustic screens and panels adjacent to the equipment causing the noise problems can be the best solution to reduce environmental noise pollution where cost of the solution is a consideration. Acoustic panels and other barrier style screening products are usually constructed from metals or polypropylene and filled with sound absorbing materials. 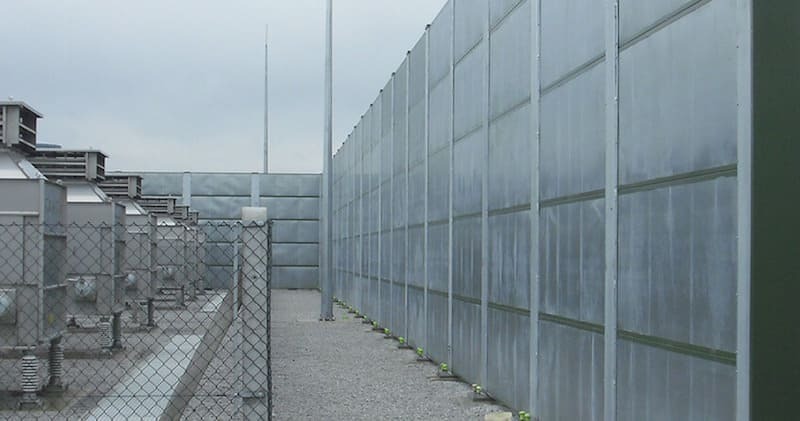 Our custom-designed acoustic barriers can be designed and manufactured to any size required, from just a few metres to over 100 metres long, and have no height restrictions. The barrier panels would usually be installed in a single straight line, ‘L’ Shape, or ‘U’ Shape configuration. Our acoustic plant structures are weatherproof and designed to last at least 20 years. Working with our sister company we can also offer ongoing maintenance contracts to ensure both the screens and barriers continue to perform at their best for many years to come, but also we maintain the machinery they contain too. Employed by Morrison Utility Services, Kimpton Energy Solutions were to design, manufacture and install an Acoustic Barrier that would reduce the noise levels of the transformers and associated electrical equipment that generate the electricity at the point where the West of Duddon Sands Offshore Wind Farm reaches land and connects to the National Grid. An ‘L’ shaped configuration for the barrier was designed and built by Kimpton. The barrier is designed to provide an overall noise level reduction of 12dBA and has an overall measurement of 70m long and 5m high and the modular construction allowed for easy manufacturing, shipping and installation on site.